CoinOpCollectorForum.com • View topic - Auto-Bell Circus Wagon Wheel? Hello. Thank goodness I found this online forum. What a great place. I need some advice. I picked up two "vintage" coin operated machines at an auction. One actually works (Keeney's Summertime). The other does not. It was made by Auto-Bell and is called Circus Wagon Wheel. Are these considered slot machines or trade stimulators? Is there a place where a person can get schematics or a manual and replacement parts? 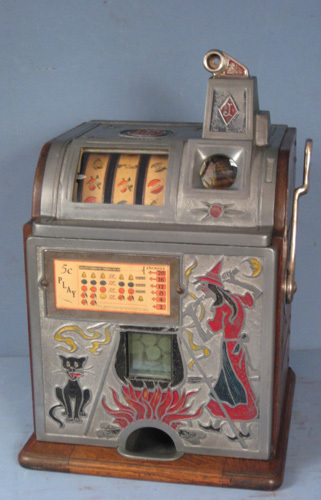 The Auto-Bell machine lights up, but goes into Tilt mode immediately. Looks like the coin mechanism inside is missing. ANY advice anyone can offer would be really appreciated. Re: Auto-Bell Circus Wagon Wheel?